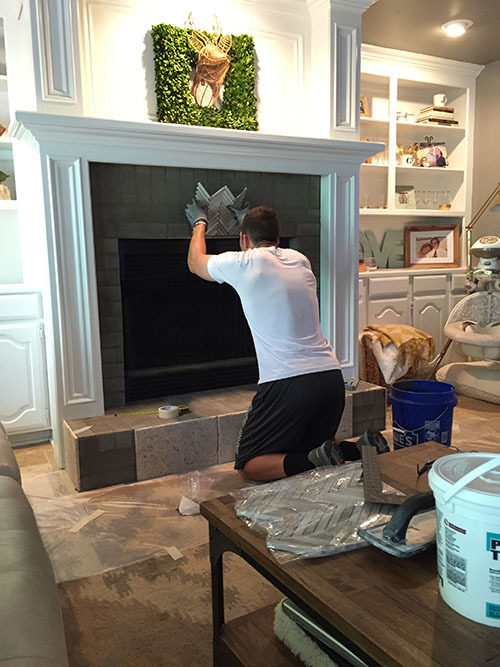 We've talked about tiling over our brick fireplace surround for a long time now, but we never got around to it. The brick wasn't really an eyesore, but it wasn't really a showstopper either. Here's a recent photo from my baby shower back in January. That's the same brick as the exterior of our house. 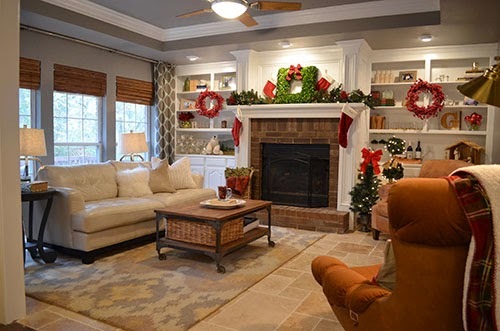 But let me go back to the beginning with this room transformation, because we have changed pretty much everything except that fireplace surround. 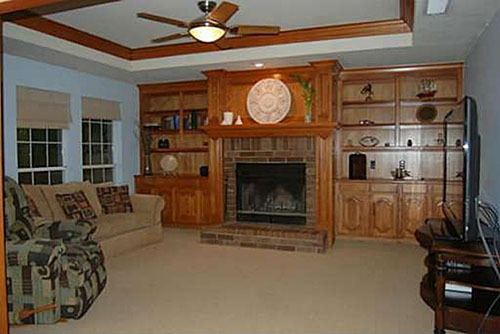 When we bought the house, the built-ins were their original wood finish and the walls were a baby blue color. Before we moved in, we painted the cabinets white and the walls gray. That was a major improvement. We put up some art, hung curtains and had a pretty nice space to watch TV. The next major improvement was swapping out the carpet for travertine. We also extended the paint from the walls up to the ceiling to better emphasize the tray ceiling. And other than rearranging the furniture and trying out new shelf accessories, that's how our den has looked ever since. We recently added some DIY framed photos of the twins to either side of the TV, which makes me very happy. Then we finally turned our attention to the fireplace. For some reason, it took me forever to figure out what tile I wanted. 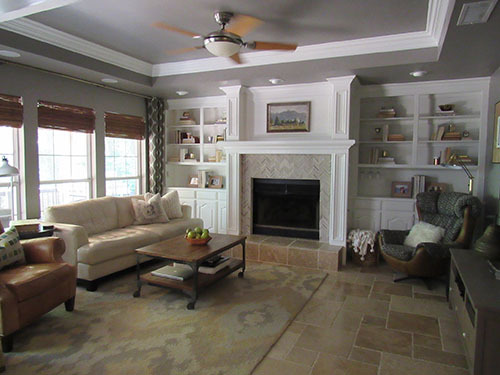 It was harder than I thought to find something that would tie in with the gray walls without clashing with the travertine floors. 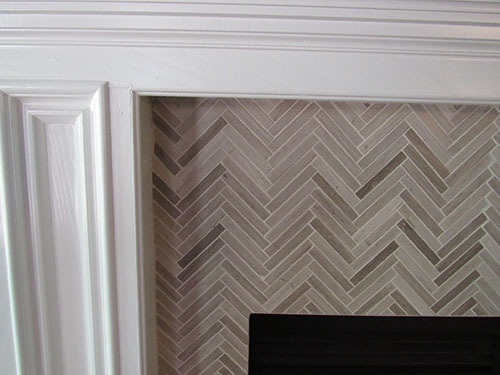 I tried several natural stone options before remembering that I already had a sample of this beautiful herringbone mosaic. Of course it was the perfect tile choice; all that design agony and the ideal option was sitting right in my garage, collecting dust! 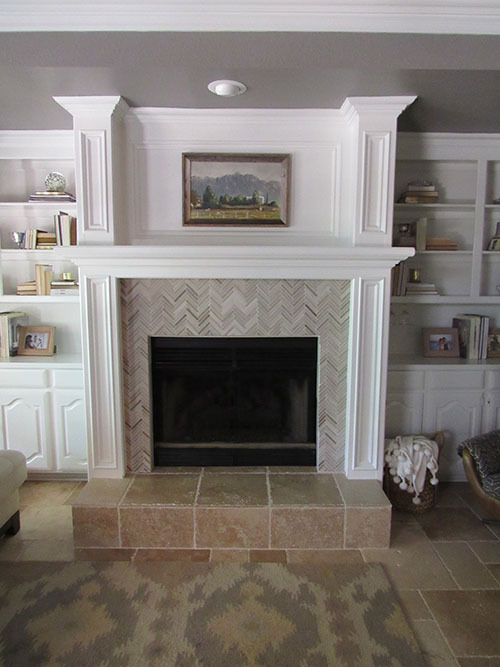 The only problem with this herringbone tile is that it was pretty challenging to install it properly around the fireplace opening. As you can imagine, it required a ton of patience to make the cuts so that everything fit together properly. It's not perfect, but it's close enough. The hubby has more patience in his pinky finger than I have in my entire body, and he did a wonderful job. 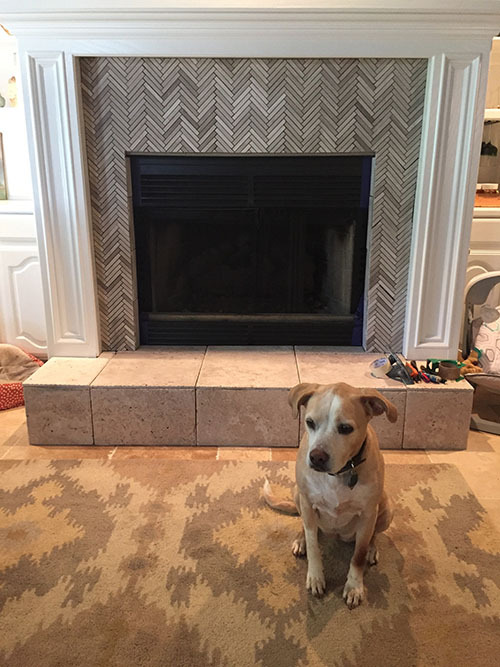 We debated about whether to continue the herringbone on the hearth, but at the end of the day we decided to extend the travertine floor tiles to the hearth instead. This option was both more affordable and faster, since the cuts for the bigger tiles went much faster than the herringbone. 1. Clean brick surface thoroughly. 2. Allow light coat of thinset to brick surface to create an even layer for the tile. Allow to dry overnight. 3. Use mortar to adhere the tile to the surface. We held the tile sheets up with heavy duty tape because we didn't finish it all in one day. This is what the tile would look like with dark grout. This was taken before we grouted. 5. Clean, clean, clean. It takes several attempts to wipe all of the grout and dust off the tiles. 8. Step back and admire your handiwork. 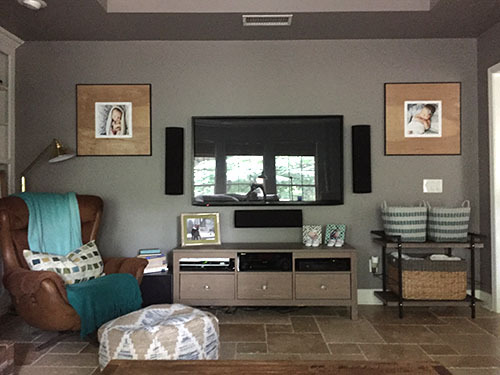 I was confident that I would love the updated look of the tile, but I didn't realize how much bigger the room would feel without that dark brick fireplace jutting out into the space. 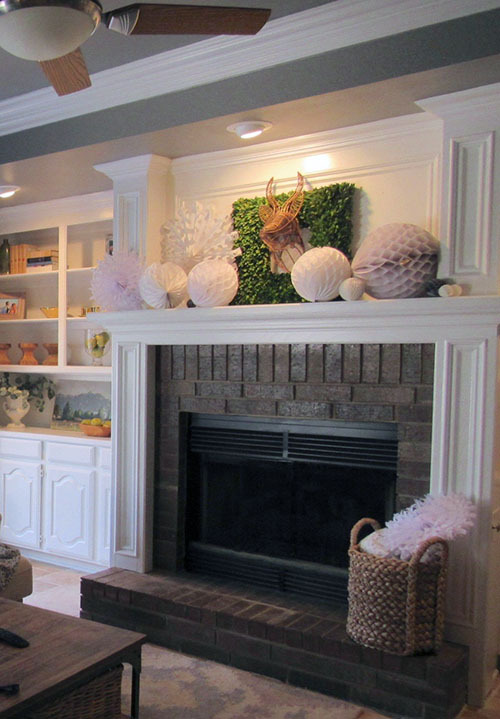 The way the griege tile just sort of blends into the background (in the prettiest way possible) inspired me to "calm" the built-in shelves around the fireplace to better complement the tile. I took away almost all of my knick knacks and instead used books that I turned backward so the pages showed instead of the spine, which makes them all the same color. Visually, it's so calm and serene. I think it looks very elegant. Is it practical if you need to use those books every day? Nope. But we don't do a lot of re-reading. Once a book is read the first time, it's pretty much just decoration. My mom and I spent a long time arranging those books, using a few neutral metallic accessories to add some interest. 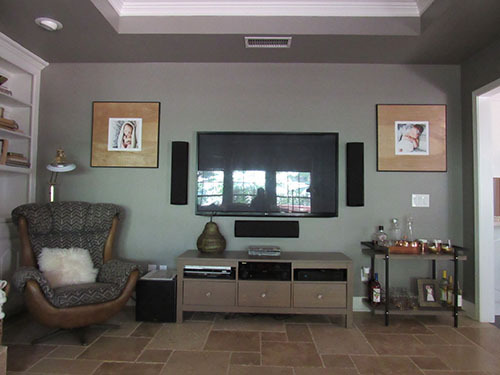 The TV area is looking a little different, too. We finally had our flea market chair reupholstered! Well, the brown leather stayed, but we replaced the rust-colored microfiber with the graphic grey pattern. The bar cart no longer houses baby items (all things baby have been moved to the play room!) and we are still loving the DIY picture frames for those smushy, perfectly edible newborn photos. Let's see the full transformation from the beginning, just for fun! Ahh, now that is satisfying. I'll be back soon with our new playroom, my mom's bathroom makeover and some other fun projects we've done lately but haven't had time to photograph and blog about! As always, if you want real time updates (since I am a bad blogger and it takes me a while to post these days), follow the blog on Instagram, Twitter or Facebook for the latest updates. You can find direct links in the top right column of the blog. Thank you for supporting our family and this blog with your encouraging comments and feedback!